Cloning has for long been there in the west in some way or the other whether for humans or for crops. The result has been a large variety of genetically modified foods (GM Foods) which have flooded the Western market over the years. Genetically modified foods are regarded as a potential solution to the world problems by the people who support it. But for many others it is regarded as a threat in many ways. Interestingly many of the world food problems in recent times have been caused due to the Western habit of cutting down crops for producing bio fuels. Cloning is act of producing a copy of something whether it is a person’s cell that is the genetic DNA or a crop variety. In India, BT Cotton and BT Brinjal are some of the genetic varieties of crops which were introduced. Interestingly these genetic varieties have had a controversial past and have seen protests of every kind from farmers. Monsanto, the organization behind the same has been alleged to be responsible for not bothering about its effects on the society and the farmers in particular. There have been reports of poor yields, crop diseases, damage of the entire crop harvest and also poor quality of the crop produced. And today these crops haven’t really got the approvals from the various authorities in the country to mass produce the genetically modified foods. But a new research study by scientists at the Center for Cellular and Molecular Biology has shown that one can clone seeds to retain its hybrid characteristics across generations. This could also allow the farmer to reuse the seeds over and over again thus saving him the high costs over the years. This kind of cloning normally happens in plant varieties. But scientists have found out that this is possible in seeds by their study on the mustard plant variety. But then this is all Greek and Latin for the farmers. What is the guarantee that this wouldn’t suffer from the same fate as the genetically modified crop variety? Would the produce of rice, maize etc. be really healthy? Would farmers get a good crop harvest? Would the crops be safe from diseases? The production of such hybrid seeds would ensure that farmers needn’t buy these seeds again and again thus helping them lower their input costs. The hybrid variety of the crops would be maintained over the years due to the cloning ability. The questions about the kind of harvest, production of the crops as well as healthy nature of the foods will need to be researched for a long time before it can be applied. But the research needs to be done to save the millions dying of hunger in the country and in the world. What India doesn’t need today is a 2nd Green Revolution which even though increased crop production had still resulted in increased pesticides, chemicals and a lot many other problems as it damaged the food chain in many ways. Instead a more focused approach to increase crop production which takes into account the well being of the people and farmers is what is required. Can cloning seeds be the answer for solving India’s food problems? Work from home goes rural. Farmers can work from home too! However the entire issue of agriculture is made murky by politicians, companies supplying seeds, pestisides, fungisides etc. Our politicians have mutated the meaning of the slogan Jaikisan. They made the agricultural income tax free, they provide subsidies on every input (seed, fertiliser, diesel for pumps, loans). The impact is there for everybody to see. Agricultural income made tax free only benifits big land holders. The small marginal farmer will never fall under tax bracket even if tax is levied. The advantage goes only to big land owners. The benifit of subsidies on diesel, fertilizers have not gone to the farmer. The dealers, stockists and the adulteration mafia have gained. Now coming to the comapnies selling hybrid seeds have been cheating innocent farmers in every way possible. With out any regulations and strict quality checks by govt. 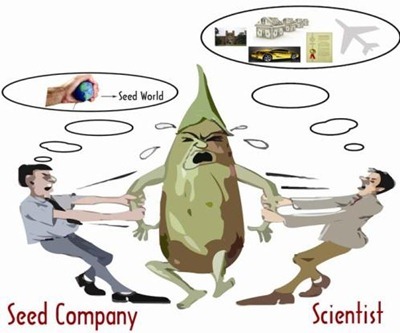 many companies are cheating farmers by selling fake seeds at high cost in the name of high yield. When the harvesting comes, then farmer realises that the yields are either low or same as normal seeds. Now some companies may be supplying genetically modified crop seeds. The GM seeds may be high yielding. However there is a massive controversy going on in this segment. Only few countries allow GM foods. Majority countries have banned GM foods. GM foods may give high productivity immediately but the consequences are unknown. The lobby in support of GM crops says until now there is no evidence. Well, the effects may come after 20 years or 30 years. By then it will be too late. I would like to give two examples of damage to people for going against nature. Normal vegitable oils have their own aroma. Butter derived from animals (Cows, buffalows, goats) have a rich aroma and smooth texture. When technology developed, scientists have found that if they hydrogenate vegitable oils, they get vanaspathi, a smooth buttery substance which almost 99% resembles butter from animals. As animal butter is expensive, only rich were using butter 50 years back. Thanks to the technology, vanaspathi was affordable to middle class and even lower class. People were happy as they can enjoy the taste of butter at low cost, companies are happy for the business. But our internal organs dont know this economy. By hydrogenation, we are increasing bad cholestorol in the vegitable oil. Our hearts which were used to vegitable oils for 40,000 years were suddenly exposed to vanaspathi. Even when doctors were crying, the vanaspathi industry said there are no effects. Slowly when heart attack rates were going up, people realised the problem and now vanaspathi is used very sparingly. It took 20 years for the effects to show up. 2) Mad cow decease : By nature cows are vegitarians. Western farmers (unlike our indian farmers western farmers have thousands of hectares of land and thousands of cows in ranches) consider cattle raising as an industry. As an industry they show keen interest in how much is the input and how much is output. As any prudent businessman, the western farmers try to maximize output for a given input. They have experimented with all kinds of feed to the cattle and found that if they feed the cattle with waste from slauter houses, the protien in the feed will increase meat very fast. They started mixing waste from chicken, fish and beef processing units with the vegitable feed and fed the cattle. Initially the economy of the business was good. The profit made out of increased beef output far exceeded the cost of animal waste. However nature has its own way. Just as humans can not process vanaspathi, cattle can not digest non-vegitation, slowly it showed in the form of “Mad cow decease” We know what happened during the peak of the situation. It took more than 20 years for nature to show that we are wrong. Similarly GM crops are un natural. Any thing against nature is wrong. We may get imediate benifits. Governments may be happy coz they get more food grains to feed its citizens and attain food self sufficiency. But may be in next 20 years or more if some problem start showing up, it will be a catostrophy. Already we are made slaves to GM crops. I remember reading some where that 100% of the potatos we eat today are GM potatos. Same with most vagitables, food grains. Companies dealing in GM crops are influencing our politicians (either by just brain washing or by bribes) into making policies which pave way for their entry. India should learn from some humble African countries which inspite of their people’s hunger are not allowing GM crops. By nature we Indians are greedy people. We tell philosophy when our stomach is full but forget it when we are hungry. If it benifits us slightly we will compromise ethics with out hesitation. This is specially true of our politicians specially like our Agricultural minister. He is more interested in Cricket (rather the ICC position) than food related issues. Personally I am strongly against GM foods. Yeah GM foods in my view have for long been a big problem in our country more because the politicians have like any other sector allowed this one too to be used for their evil means and purposes.